16m². Comfortable room with Moroccan seating area, beautifully decorated with Zelliges, plaster, carved and painted cedar furniture, stained glass and views to the patio. 16m². Elegant room with Moroccan seating area, beautifully decorated with Zelliges, plaster and carved prestigious Atlas cedar wood. 30m². Marvellous suite located on the patio. 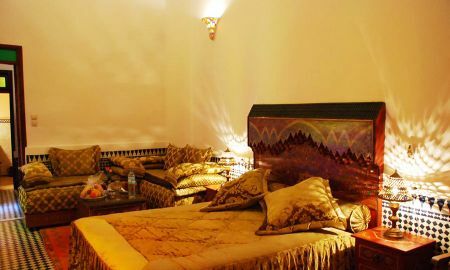 From the sofa located at the center of the suite, you can admire the view of the Riad. 30m². Marvellous suite located in front of the patio and its fountain. 30m². A unique sensation of calmness will envelop you in Fes suite located upstairs, with views to the patio and its beautiful fountain. Pleasant room decorated with Zelliges and stained glass. The Ouarzazate room unveils its charm and flamboyance with marvellous Moroccan crafts: stained glass, Zelliges, cedar panelling, plaster, wrought iron. Let your senses enjoy the splendour of the scenery and the magic atmosphere of the Kansara room, where the balance of flamboyant colours and fine materials will immerse you in an atmosphere of unusual serenity. Rabat suite will enchant you with its charm and perfect balance of warm colours and noble materials. Located on the second floor, Meknes Royal suite offers a marvellous view to the patio with its magnificent fountain. 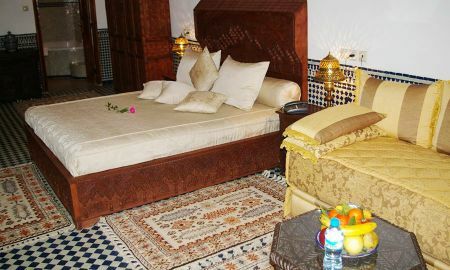 Riad La Perle de la Medina is a prestigious guest house located in the Medina of Fes, the first imperial city and capital of Morocco. Combining flamboyant colours and fine materials, the rooms at La Perle de la Medina are all elegantly decorated with warm tones and original handcrafted artworks to immerse you in an atmosphere of rare serenity. The marvellous city of Fes could form throughout history, its own culinary identity with Andalusian, Berber, Jewish, oriental and European influences. At La Perle de la Médina, a delicious and refined cuisine is served with gourmet and voluptuous flavours to delight all tastes. For your moments of relaxation, unwind in the magnificent patio to enjoy the fountain’s soothing sound of flowing water or in the beautiful terraces with panoramic views to the Medina of Fes. 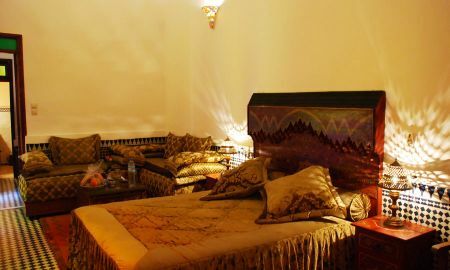 Riad La Perle de la Medina enjoys an easy access by car, in the neighbourhood of Douh, close to the Batha square and near the famous Bab Boujloud.